This statistic depicts the total sales of Nestlé's confectionery sector from 2010 to 2018, by segment. 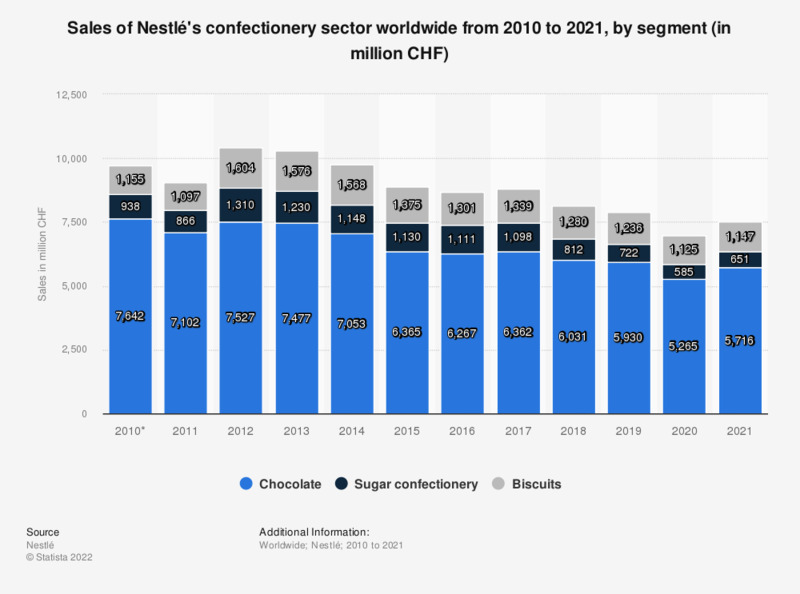 According to the report, the sales of Nestlé's chocolate segment amounted to about 6.03 billion CHF in 2018. The total sales of Nestlé's confectionery sector amounted to about 8.1 billion CHF in that year. * In 2010 Nestlé restated its accounting policies. Further details can be found under "Note 1" in the Consolidated Financial Statements 2010. CHF is the acronym for Swiss Francs; currency of Switzerland. Everything On "Nestlé" in One Document: Edited and Divided into Handy Chapters. Including Detailed References.